This movie makes me so hungry! Hungry for food and fashion! 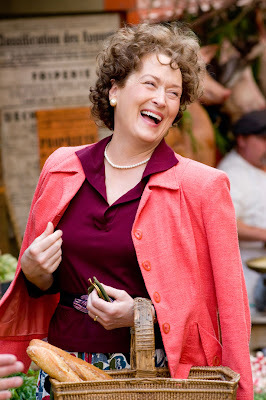 I saw Julie and Julia over the summer when it was in theaters and just loved it! It's funny, it's sad, it's sweet and above all it's about a girl, her passion and...a blog. In 1948, Julia Child and her husband, Paul moved to France, where Julia studied cooking at Le Cordon Bleu. Julia Child was extremely tall, even by today's standards, which just goes to show you that even when you aren't the ideal womanly shape or stature in the 40's and 50's, you can still look (and be) fabulous! One word of warning, though- make sure to have some sort of sinful and divine snacky type thing or else you'll be running up the street for some gas station cheesecake. Tune in for next week's Fashion and Film Friday: The Notebook. 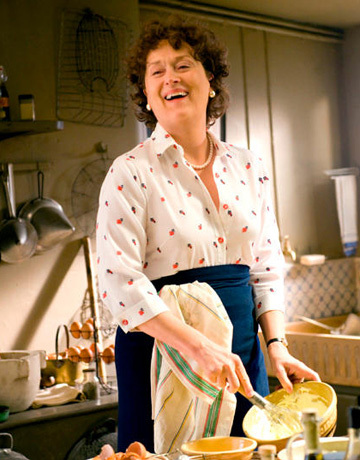 I love this movie, for the same reasons You do, plus I also love Julia Child's cooking. I am also a big fan or old movies that it's hard to pick only one, anything with Elizabeth Taylor, Audrey Hepburn, Doris Day, the list it's looong... I just love the fashino in clothing and in the sets.... Have a nice weekend. I have yet to see the movie, though I so want to. I really enjoyed the book and all of the blogging development throughout it! I had the same problem! I wanted to go cook and since we hadn't gone grocery shopping, I was trying to figure out what fancy thing I could make with olives, stale popcorn and mustard. I loved this movie. I watched it with my friend, however we made a mistake and watched it just before dinner. Even when the movie ended we had a half hour wait, it felt like DAYS.